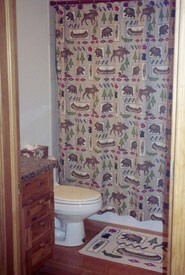 Moose Tracks Lodge is a beautiful home with private hot tub that is truly one of a kind in old town Winter Park. 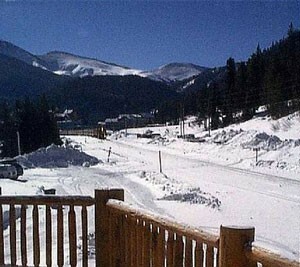 Open and bright, it is located only a short walk from the Winter Park base. Our home has a cozy, rustic atmosphere and is great for a large family or group. We have beds for 13 people; two bedrooms each with a queen size bed, a loft with two queen beds and a queen futon, as well as a queen sleeper sofa in the family room. On the home's main level is a gorgeous gourmet kitchen with granite counters, hickory cabinets and upgraded appliances. The kitchen is open to the large two story family room with a gas fireplace and great views of the mountains and ski slopes. Off of the main level is a deck with an 8 person hot tub and a gas grill. All the wonderful activities Winter Park has to offer are just outside your door. From skiing in the winter, to mountain biking, hiking and the music festivals in the summer we are ideally located to enjoy them all. We are just a short walk to the Fraser River Trail. Train enthusiasts will love our close proximity to the Southern Pacific Railroad as they watch the trains go by. The best skiing in Colorado, Music festivals, Apline slide, putt-putt golf, rock climbing, ice skating, wildlife viewing, shopping, cross country skiing. Well, I don't know how many times I have stayed at the Moose Tracks Lodge. 6 or more, I'm sure. Every Spring and every Fall. Unfortunately my group of scrapbooking friends and I couldn't get up there this Spring with our scheduling and we stayed at a different location that was closer to home. Never EVER again will we stray from Moose Tracks. The comfort, the cleanliness, the scenery, and everything else, even the train, were very missed! We're coming back in the Fall 2008 and we'll be scheduling that very soon! Thanks for offering up your gorgeous mountain home! I should have posted this sooner. We stayed in Moose Tracks in June of 2005 and it was PERFECT. The photos don't do it justice! And the rooms? The rooms are spacious and plush and the beds are so comfortable. And the kitchen was wonderfully equipped. We dined in most evenings and went exploring during the days. It was utterly relaxing -- it snowed a few times while we were in the hot tub! If we head back to the area again, we'll definately stay there! April 20, 2004 Reviewer: Jeff and Tracy Davis From: Harrison, AR. We stayed 4 nights in January and had a wonderful time. The house was fantastic and has so much more to offer than is advertised. There was so many little things such as lotion, q-tips, needle and thread,vcr tapes,etc to name a few. We had 10 family members and had plenty of room to spread out. The view is great and we took advantage of most activities in Winter Park. We especialy enjoyed the snowmobiling. We highly recommend this home and plan to return again. Moosetracks Lodge is an awesome place to stay. 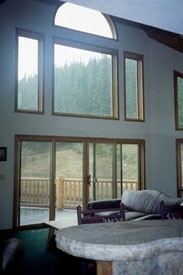 The lodge itself is not only beautiful, it is also spacious and filled with many extras. 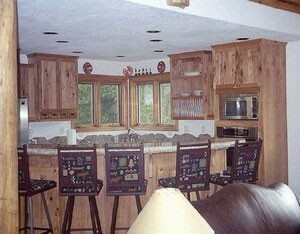 The kitchen is well stocked for large numbers of people and the appliances were first rate. Our children loved the trains and we were not bothered by them at all. We especially loved the hot tub after long days on the slopes. The washer and dryer were great and we never ran out of hot water! Although only 10 of us actually stayed there, we had up to 20 people for dinner and there was plenty of room for everyone. I highly recommend this vacation home for everyone. We had a blast!!! 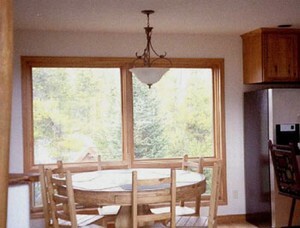 1/16/03 to 1/20/03 Moose Tracks Lodge is an incredible place to take a winter vacation at. It is everything that it is advertised to be plus so much more! I found the owners to be nice, honest, and trustworthy people who have great communication skills! 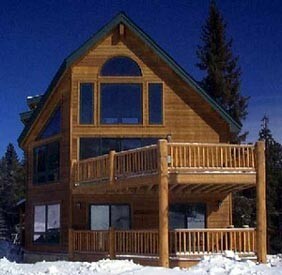 I would HIGHLY reccommend Moose Tracks Lodge to anyone wanting to visit Winter Park, CO!! We had a great weekend at Moose Tracks Lodge, what a fantastic place. We loved how close it was to the base of Winter Park. We especially enjoyed the scenic view from the hot tub at the end of the day. 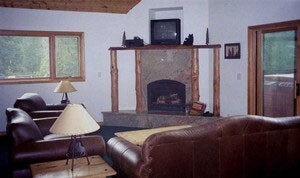 The lodge itself is beautiful with an incredible kitchen, comfy beds, and a cozy fireplace . It easily accomodated our group of 12. We will definately be back! 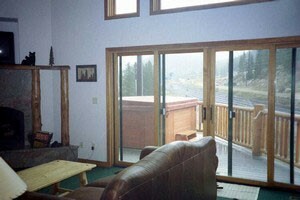 We had the best of both worlds when we stayed at Moose Tracks Lodge in Winter Park. Our time there was over the Memorial Day weekend, and we had not only great sunny weather, but we also had a taste of winter as well. It snowed our first night there and it was gorgeous! The weather just got better as the weekend went on and we enjoyed bike riding on the Fraser River trail and a picnic next to the river. The lodge itself is awesome! It is large enough for a family to spread out and not feel cramped or can accommodate a large group as well. It was a relaxing place that allowed our family some much needed down time. We have children, ranging in ages from 7 to 15 that were so excited about watching the trains go by, it was really not a disturbance, but a fun experience for the whole family. We would highly recommend the Moose Tracks Lodge to anyone, we plan on going back soon! Wow, what a great weekend we had at Moose Tracks Lodge. The house nestled in the evergreen trees at the base of Winter Park Ski Resort provided gorgeous views of the mountains with all the comforts of home. We were impressed with the floor plan and open design. The bedroom, bathroom, living room and kitchen layout was ideal. We were especially impressed with the elegant gourmet kitchen adorned with upgraded appliances, granite counters and rustic cabinetry. Also, the availability of a washer and dryer was an added bonus. What a wonderful place to relax and enjoy all that Winter Park has to offer! Stays less than 4 nights add $175 cleaning fee. Stay 6 nights get the 7th night free! Tax not included. Deposit: 25% deposit due within 14 days to hold reservation. Remaining due 60 days prior to stay with a $300 refundable security deposit. Cancellations and Refunds: Full refund less one night's rent if cancelled prior to 60 days. If cancelled within 60 days, no refund unless nights can be rented out again, then the same refund policy applies. Other Fees: Refundable $300 security deposit. $175 cleaning fee for less than 4 nights.